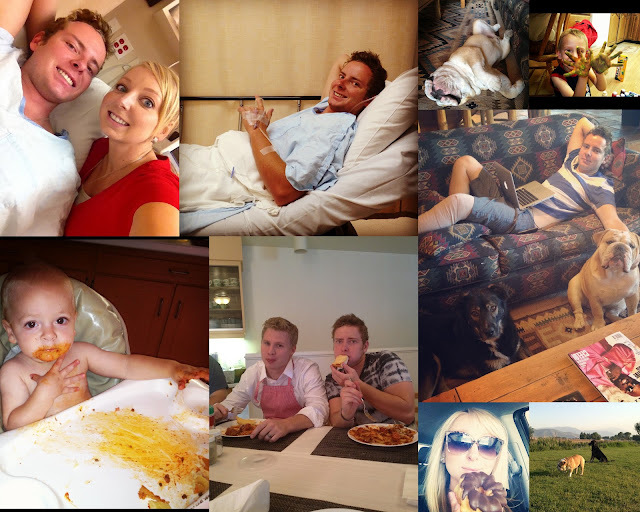 2 top left photos and middle right: my younger brother, Aaron, had knee surgery to repair his torn ACL and meniscus. He had this same surgery in February. How did he tear it again you ask? Mountain biking 3 months after his first surgery. He is on permanent lock down of any physical activity for the next 5 years. He is staying with us for a while so he can recover and I can police his every move. He's doing great though, his doctor said that he is way ahead of schedule when it comes to recovery so that's fabulous news. 2 top right photos: Kipling recovering also. He fell into the pool at A's parent's house and sank like a rock. It was quite traumatic for him and he's spent the past few days sleeping off his PTSD. I need to get him a life jacket. The other photo is of my nephew Tyler who is now moved back from North Carolina and it is awesome! We had a finger painting session the other day and he created some masterpieces that Michelangelo would be proud of. 2 bottom left photos: Diane Lungo, my neighbor in Orem and adoptive auntie, is Italian and makes the best spaghetti dinners so we invited ourselves over one night and ate like kings. We are still in a food coma from that one. 2 bottom right photos: my craving from last week, french crullers, and K hanging out with his best bud Jaxx, Aaron's dog. 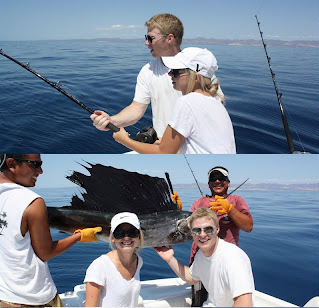 oh yeah, just a sailfish. no biggie. Any who, we're going fishin' and it'll be awesome. A taught me how to cast with his new fly rod, I'm terrible but he's too nice to say so. He really needs this little trip since he's probably not going to Alaska this year with his dad and brothers, just bc we're going to have a baby and all. Speaking of baby, she is getting large. I didn't know my body could stretch like this! top: 33 weeks and 3 days as of today! 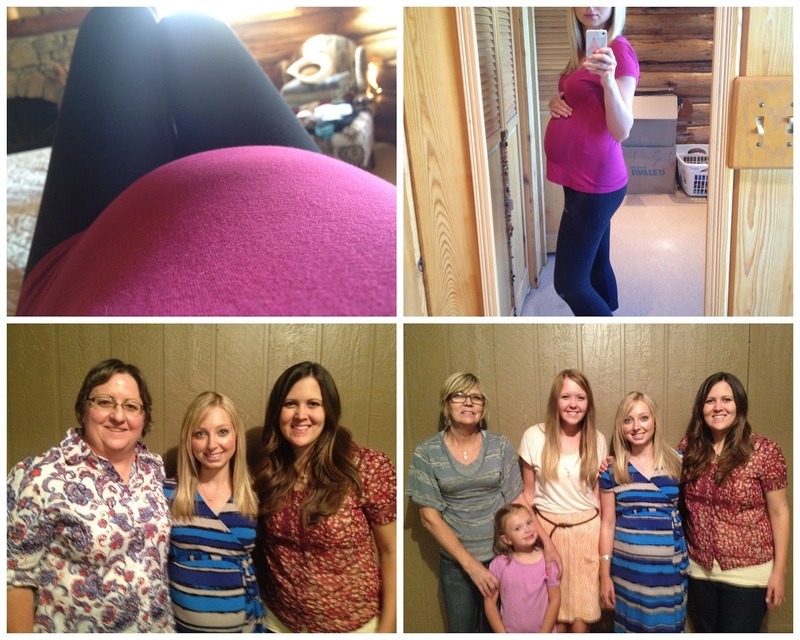 bottom: the only photos I got of the baby shower Whitney and her sweet sister and mother hosted for me last week. It was fabulous and so much fun, trust me. You might want to overt your gaze if you have issues with pregnant bellies. I normally won't post it because I generally have issues with pregnant ladies just throwing their large bellies out into the world wide web bc, let's be honest for a moment, most maternity photos are not attractive. (If you don't believe me just go here, and another disclaimer there are a pair of ta-tas that make an appearance towards the bottom of the page on that link. Just stop scrolling when you see the woman with the black shirt and gun, what did I tell you? weird.) But this is not a "maternity photo", this is just our first family photo with the babe and I thought it was cute. If you disagree I totally understand, at least I warned you. next thing you know I'm going to be posting photos of me breastfeeding. Just joking, I promise never to do that to you. Movement: she had hiccups last week and it was so cute! some good kicks now and then, it's getting to be a tight squeeze for her in there. Anything making you queasy or sick: I did get really bad vertigo once this week, it was kind of scary but A was there and took care of me. Gender: Girl, I made the doctor check again just to make sure we won't be surprised. Symptoms: fatigue and heartburn still, will the madness ever end?! Happy or Moody most of the time: happy, but I'm so tired I can tell that's taking a toll on my emotions. This week at breakfast A and I were talking and I eventually muttered through my tears, "I'm just so tired." You look great! I totally had the "im just so tired" moments. And even more of them the first few weeks after giving birth. Greg would come in the room and I would just be sobbing on the bed because I felt like I couldn't possibly stay awake another minute. But once I would fall asleep Rees would wake up and I had to too. Its so hard, but SO worth it!!! Krystal! You look awesome! I'm so excited for you. Just so you know, by 33 weeks into my first pregnancy, I had gained 50 lbs. I'm am ugly pregnant lady. You, however, are adorable. thanks guys, there are just those days when I need a little encouragement! That totally doesn't count as a naked belly picture. I hate those, and this is not at all uncomfortable. You look super cute, BTW!